An edited version of this post was first published in the Ghost Fishing UK newsletter, June 2018, and is reproduced here with permission. Photographs © Ghost Fishing UK, used with permission. Truth be told, I was feeling nervous, sitting in my place on the boat. It had been a few months since Scapa Flow, where I’d become a ghost fisher. I’d kept in touch with the team, and even started a course to fine tune my buoyancy and propulsion. But now I was back, and wondering whether I was up to it. This time it was Plymouth, on the English south coast. I’d traveled down from Leicestershire the day before. 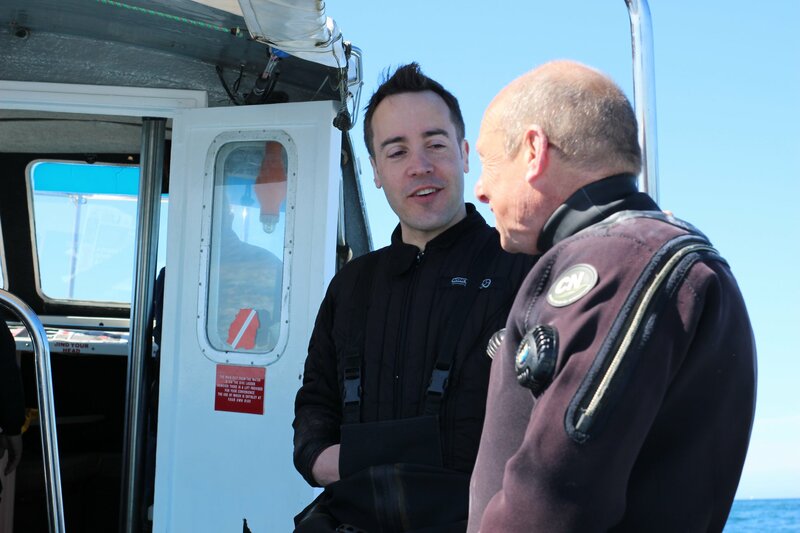 The weather was glorious, fine conditions for diving. Most of the team met that night, many familiar friendly faces, for beer and pizza. But where would we be diving? The Scylla. A wreck I’d thankfully dived a few times before. HMS Scylla is a Leander-class Royal Navy frigate that was taken out of service in 1993 and sunk as an artificial reef in 2004. In Greek mythology Scylla is a monster that lived on one side of a narrow channel of water, opposite her counterpart Charybdis. Our Scylla is 500m from the Liberty ship the SS James Eagan Layne, and a much more appealing prospect to visit. Soon it was Monday morning, we’d got our gear onto Venture, and were gathering at Mountbatten for a briefing. Fred was in charge. Dive one we would be surveying, and dive two lifting. For the first dive I was with Garry, a regular buddy from my club back home, and Christine. Christine would have a camera, so I’d better not mess it up or there would surely be evidence! We dropped into the water, and headed to the shot line. Descending as a team, I relaxed. The visibility was excellent; the strong spring sun lighting up the ship from above. We reached the deck to find a small piece of rope, heavily colonized with life, snaking around the ship. After briefly noting it, we were off swimming. Now, for reasons that were thankfully nothing to do with me, we arrived at the flat end of the ship. The plan had been to head for the pointy end. Someone was in for a ribbing! Fortunately, not me! We recorded several pieces of net, and the remains of some unfortunate crabs. All too soon the survey was complete and it was time to return to the surface. For the second dive I was with Fred, and joined by Christine and Rich…both of whom would have cameras! We were to attack a tangle of thick rope net and monofilament that was lodged under the stern between the propeller shafts. Well, at least I’d been to that end on the first dive! The plan was to tie a rope to the net, feed it out from under the ship, and connect a lifting bag to put tension on the net. I had the stage cylinder and lifting bags, and Fred the Green River knife, which he’d use to slice through the net and allow it to peel back from the seabed and out from under the wreck. To cut a long and silty story short, the plan worked well and before long the net was free, and safely lying on the seabed away from the wreck. Day two. The Elk, a trawler sunk by a mine in 1940 during trials of experimental mine countermeasures equipment. Well strictly speaking, the reef to the southwest of the Elk. The weather was perfect again, and we were hunting a long monofilament net. The plan this time was to have the whole group act as a single team. We’d free the ends, gather the net, and tie it into a long sausage, attaching a series of lifting bags along its length. The aim was to complete a thorough survey and then lift the net in one dive. Contingencies were discussed and a series of OK signals agreed so we’d be certain everything was in order before the lift; good communication would be key. So it was back to the Scylla to finish what we’d started the day before. I was back with Jason, and joined by Angelo, to collect small pieces of net and rope from the port side of the ship. We worked together, maneuvering around close to the seabed, filling net bags and attaching lifting bags. I was glad of my newly acquired back kick! Having sent the bags up it was time to leave once more, satisfied with a job well done, and a cleaner, safer wreck left behind. 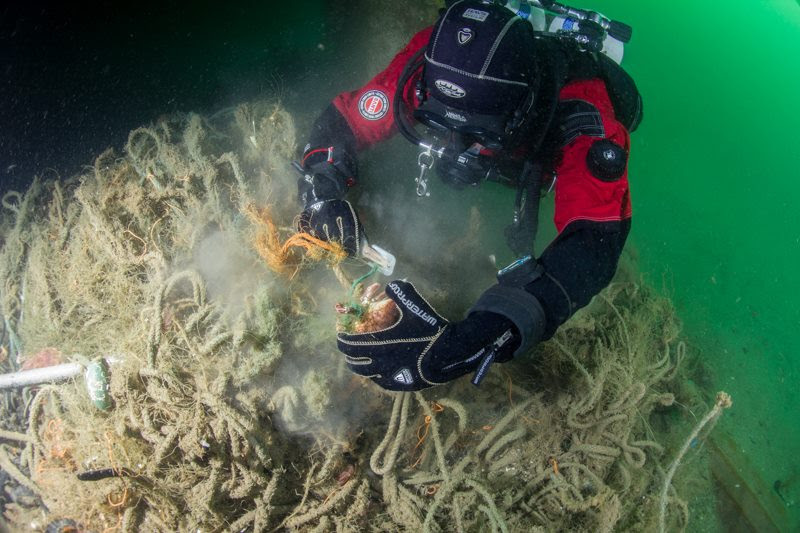 You can help by donating, or reporting sightings of ghost gear. Stay informed by signing up for the newsletter.